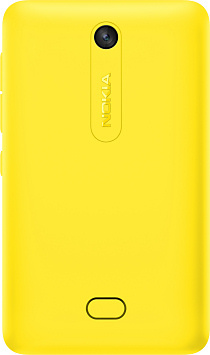 The new Nokia Asha 501 represents a significant evolution of the popular Asha line of handsets, with major changes under the hood as well as a new design that echoes many features of Nokia's Lumia range. Slated to cost around $99 before tax and subsidy (approximately €75, £64 or Rs5400) the Asha 501 is just a little bit cheaper than an ultra-basic Android smartphone. Perhaps the biggest change is the software. 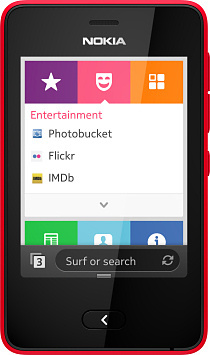 The familiar Series 40 platform has changed into the "Nokia Asha" platform. Nokia have used technology from Smarterphone (one of their subsidiaries) to completely refresh the user interface, and one of the main new features is something called "Fastlane" which allows swipe access to frequently-used phone functions, based in part on the interface from the Nokia N9 MeeGo phone. Nokia are promoting the new Asha as a smartphone with a range of new developer tools to encourage new applications for this platform. Applications can be written in Java (as is the case with Series 40 already) or using a new Web Development Environment to help create web-based apps (which sounds something like the Firefox OS platform). We wouldn't actually regard this as being a smartphone as Java and web apps are not native applications, but most customers will probably not care. As for the Nokia Asha 501 itself, this is a compact device with a 3" 240 x 320 pixel capacitive touchscreen display, a 3.2 megapixel camera and a microSD slot with a 4GB card included in the standard sales package (which also includes a stereo wired headset). Underneath the hardened glass display is a single "back" button, and the back covers can be replaced with a different colour if you like. This is a dual-band GSM device available in single-SIM or dual-SIM configurations. WiFi support is included though, so high-speed internet access is possible. If surfing on a 2G GPRS connection, the inbuilt Nokia Xpress browser will re-render the pages to load more quickly and display better on the smallish screen. The 1200 mAh battery gives up to 17 hours talktime and 48 days standby on the single-SIM version, with 26 days on the dual-SIM one. The Asha 501 weighs just 98 grams and measures 99 x 58 x 12.1mm, which makes it quite chunky. Social networking support is included, and there are 40 free EA games to download. Although the Asha 501 isn't as sophisticated as a full-blown smartphone, it does still look quite usable. 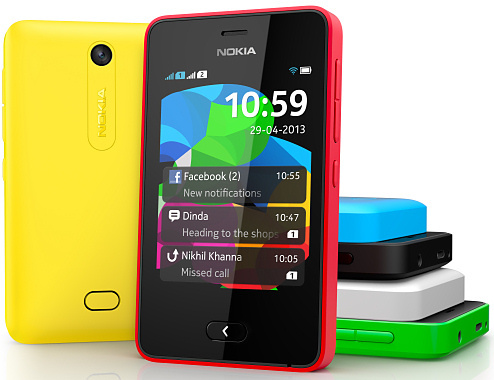 The Nokia Asha 501 will be available in red, cyan, yellow, green, white and black colours. Nokia say that it should be available from June 2013 onwards.